The combination of an infrared light-emitting diode (IR LED) and a photodiode is often used as a proximity detector, an electronic gadget that detects when an object is nearby. One way to build a proximity detector is to mount the IR LED and the phototransistor so that they face each other. Then, the infrared light from the IR LED is detected by the phototransistor. 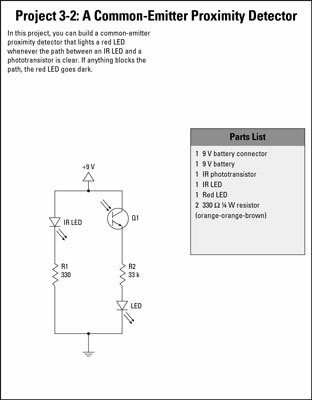 If an object comes between the IR LED and the phototransistor, the light is blocked, and the phototransistor turns off. 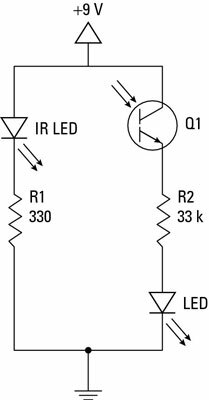 This circuit assumes that IR LED and Q1 are oriented so that Q1 can detect the infrared light emitted by IR LED, either indirectly (for a proximity detector) or directly (for an interrupter). This circuit is called a common-emitter circuit because the phototransistor’s emitter is common between the phototransistor side of the circuit and the output side of the circuit that’s connected to the IR LED. In a common-emitter circuit, the output voltage is on when infrared light is detected by the photo-transistor. Thus, the red LED lights up when the path between the IR LED and phototransistor isn’t obstructed. If you block the path between the IR LED and phototransistor, the red LED goes dark. 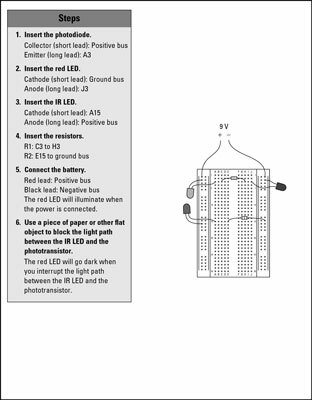 When you connect this circuit to power, the red LED will come on. 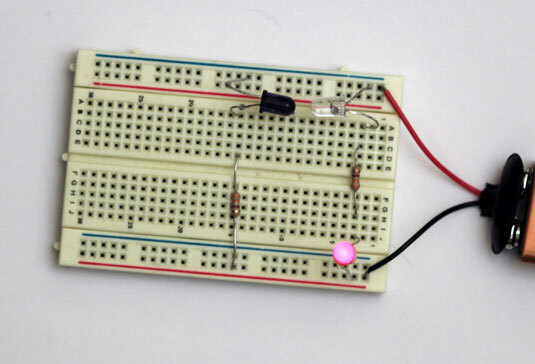 If you pass an object such as a piece of paper between the IR LED and the phototransistor, the red LED will go off. The output in this circuit is simply a red LED. However, you could just as easily connect the output to other circuit components. For example, the output could drive a mechanical relay if you want to use the proximity detector to turn on a floodlight or other 120 VAC device, or you could connect the output to a digital logic circuit.